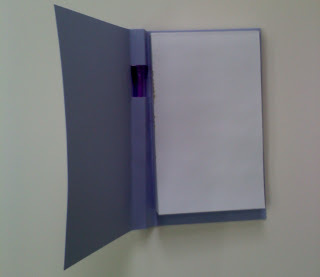 When you need paper to write something down, and its not available, do you get frusterated? Have you so many lists but lose them? I have lists for everything... I am sure there is a med for this behavior, but I do. I now have another car at my disposal - that I need to put a notepad in for my list obsession... for lack of better terms. I wanted it to be small, but useful and HAVE A PEN with it.. (second pet peeve- no pen when I need them) . I found these cute little pads of paper and dressed them up! I like them so much I think I might put one in my purse... you know? 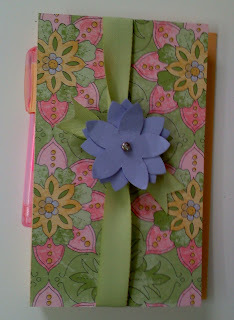 I have used Tea Party paper and some other coordinating colors. 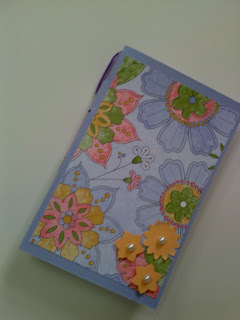 Just little pearls for inside the flower punches. They are a great addition to a birthday gift or just alittle simple 'thank you'. I am keeping these little guys at hand for any moments notice when I need something.. I guess I will put on my own 'list' to make more.. LOL.. what a cycle. Love this little pad! where can I find the directions? Thanks for sharing!